(Newser) – Ikea has apologized for eliminating women in catalogs distributed in Saudi Arabia, apparently so as not to offend Muslims. 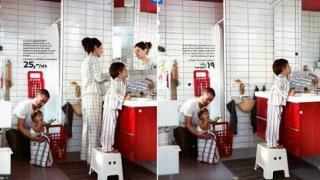 Scenes featuring families using Ikea furniture and other products are missing mothers in versions that appear in the Arab nation. Not a single woman appears on any of the pages, reports ABC. The move infuriated female shoppers, who make up the lion's share of Ikea consumers, with some women vowing to "vanish" from Ikea stores. “We should have reacted and realized that excluding women from the Saudi Arabian version of the catalog is in conflict with the Ikea Group values,” the company said in a statement. A spokeswoman added: "We're deeply sorry for what has happened. We understand why people are upset." We should have reacted and realized that excluding women from the Saudi Arabian version of the catalog is in conflict with the Ikea Group values,” The only "group values" you have Ikea is called money and that's about it. I don't really understand why people were offended, sounds like Saudi women aren't allowed to do much if anything at all, so I understand IKEA being over protective about not offending people. It just sounds like a cultural sensitivity move that was misinterpreted and I think people are being way to hard on them. Though I do agree that doing business there must be terrible especially for women in business.